Acrylamide is a water-soluble monomer, industrially produced by the hydration of acrylonitrile. The traditional or synthetic route utilizes a copper oxide catalyst whereas the biosynthetic route is based on an immobilized nitrile hydratase biocatalyst. The biosynthetic route is claimed to be more efficient than the traditional one and is being used increasingly. The principal acrylamide derivatives are polyacrylamides (both homopolymers and copolymers) that have varying water solubility characteristics. These polymers are used widely in water treatment, petroleum production, pulp and paper production, mineral processing, and numerous small-volume applications. 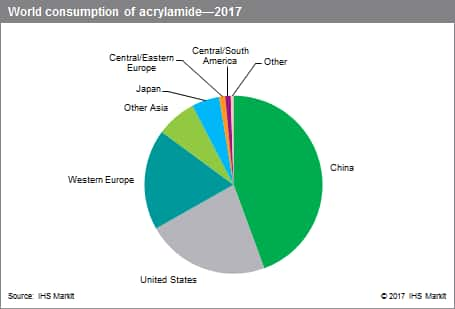 The bulk of the production of acrylamide is concentrated mainly in China, Western Europe, and the United States, with China accounting for over 60% of the global production capacity. The acrylamide business is globalized, as manufacturers locate world-scale production facilities closer to the consumption locations and exploit lower-cost production locations and process efficiencies through new technology and downstream integration. The top six acrylamide producers account for over 60% of global capacity. SNF is the largest producer worldwide, followed by three Chinese companies—Beijing Hengju, Petrochina Daiqing, and Rudong Natian. Globally, the large majority of acrylamide is consumed to produce polyacrylamide (PAM), which is then used in wastewater treatment. The manufacture of PAM for enhanced oil recovery (EOR) and other petroleum production processes follows as the next-largest market. Acrylamide use in pulp and paper manufacture also accounts for a share of the market of about 16–18% of global consumption. Water management is the leading segment in the United States and Western Europe, while paper uses dominate the Japanese market. EOR will continue to be the largest segment in the Chinese market, followed by water treatment. In Western Europe and the United States, large quantities of acrylamide are believed to be consumed in the manufacture of polyacrylamide, which is devoted to the export market. For this volume, no breakdown by end-use market is available. China accounts for 44% of global acrylamide consumption and will continue to be the leading acrylamide consumer during the forecast period. The next consumers in order of importance are the United States and Western Europe. However, a large portion of the acrylamide consumed in these countries is actually used to manufacture polyacrylamide, which is then exported to other regions. Future growth in demand will be driven primarily by the increasing use of polyacrylamide in the water management sector in China and Other Asia, which will have the fastest growth rates worldwide. Use in paper is expected to have limited growth in developed economies, whereas it should increase faster in Asia (excluding Japan). The US acrylamide market should see strong growth in petroleum processes such as hydraulic fracturing and EOR. The market for acrylamide is currently oversupplied. Overall, the global market for acrylamide is expected to grow at a rate of 3.5–4% during 2017–22. For the same period, a significant volume of new capacity has been announced in Asia, mainly in China. As a consequence, the market will remain oversupplied unless some restructuring occurs.